Karst is a landscape formed from the dissolution of soluble rocks including limestone, dolomite and gypsum. It is characterized by sinkholes, caves, and underground drainage systems (Fig. 1). Nearly all surface karst features are formed by internal drainage, subsidence, and collapse triggered by the development of underlying caves (Palmer, 1991). Rainwater becomes acidic as it comes in contact with carbon dioxide in the atmosphere and the soil. As it drains into fractures in the rock, the water begins to dissolve away the rock creating a network of passages. Over time, water flowing through the network continues to erode and enlarge the passages; this allows the plumbing system to transport increasingly larger amounts of water (Gunn, 2004). This process of dissolution leads to the development of the caves, sinkholes, springs, and sinking streams typical of a karst landscape. Fig. 1: The features of a karst system. Why is a karst important? Dissolution associated with karst development in central Texas limestone has created a complex underground water flow network that includes caves large enough for humans to access. Rainwater travels through the network, controlled by the Balcones fault system, until it reaches the water table (Ferrill et al., 2004). The karstified limestone acts as an aquifer where water can be stored and later extracted by humans. Two million people in central Texas get their drinking water from the karst aquifer known as the Edwards Aquifer (Sharp and Banner, 1997). This resource is especially important for central Texas as the region becomes more urbanized. With a higher density of people, central Texas will face higher demand and increased pollution. Just like rainwater, pollutants can easily pass through the karstified limestone. Another difficulty is that streams and surface runoff entering the aquifer via sinkholes and caves bypass the natural filtration produced by seeping through soil and bedrock. This direct recharge quickly replenishes the water supply; however, it also leaves the aquifer particularly vulnerable to contamination (Drew and Hötzl, 1999). For more information, check out The Karst Portal. Drew, D. and Hötzl, H, 1999, Karst Hydrogeology and Human Activities: Impacts, Consequences and Implications. Brookfield, VT: A.A. Balkema Publishers, 332p. 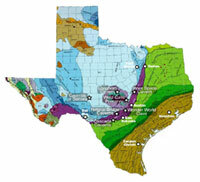 Ferrill, D.A., Sims, D.W., Waiting, D.J., Morris, A.P., Franklin, N.M., and Schultz, A.L., 2004, Structural framework of the Edwards Aquifer recharge zone in south-central Texas. Geological Society of America Bulletin, v. 116(3-4), p. 407-418. Gunn, J., 2004, Encyclopedia of Caves and Karst Science. New York: Fitzroy Dearborn, 902p. Palmer, A.N., 1991, Origin and morphology of limestone caves, Geological Society of America Bulletin, v. 103, p 1-21. Sharp, J.M., Banner, J.L., 1997, The Edwards Aquifer: a resource in conflict, GSA Today, v. 7 (8), p. 1-9. An aquifer is a body of rock that can store and transmit significant quantities of water (Gunn, 2004). Rocks vary in the way they store water according to their porosity and permeability. Porosity is the percentage of open space in a rock or surface material. Permeability is a measure of a material’s ability to transmit fluids. If the pores are very small or if they are not connected to form a channel, the material will have a low primary permeability. If the material is fractured (broken) the permeability will be increased. A sandstone aquifer, for instance, acts like a sponge, and water slowly seeps between the grains of sand at a rate of inches per day. 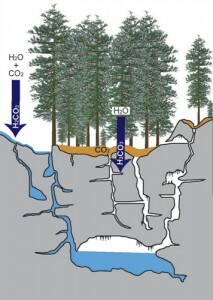 A karst aquifer, on the other hand, stores water in fractures, conduits, and cavities (Fig. 1) and can transport water up to miles per day! 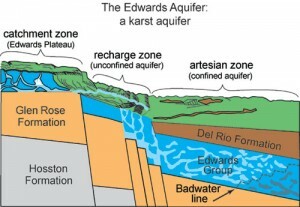 The Edwards Aquifer is a karst aquifer. It covers an area of approximately 4000 square miles stretching from Rio Grande River, near Del Rio, to the town of Salado in Bell County, Figure 2 (USGS, 2004). 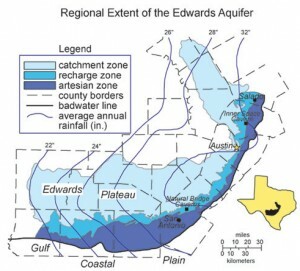 On the surface the Edwards Aquifer is comprised of three areas: the catchment, recharge, and artesian zones. The catchment zone collects rainfall and directs it to the recharge zone. Surface runoff enters the Edwards Limestone through fractures, sinkholes, and sinking streams within the recharge zone. This area is considered an unconfined aquifer because water can enter and exit freely. 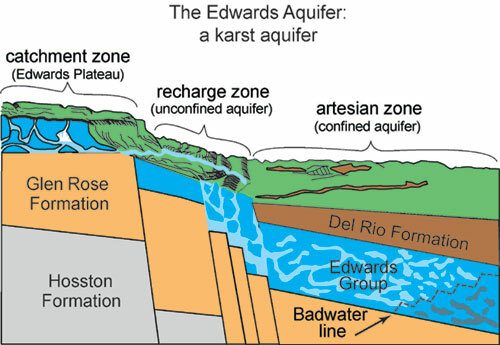 The artesian zone is a confined section of the aquifer. The Del Rio Clay acts as a barrier, holding water in and preventing further recharge. In some places in this zone, groundwater is under pressure and is released in artesian springs. Fig. 2: The Edwards Aquifer extends through all of central Texas (Musgrove, 2000). The down-dip limit of potable water in the aquifer is defined by the bad water line (1000 mg/l). There are two main threats to the Edwards Aquifer: pollution and extraction. Urbanization concentrates pollution by collecting pollutants on impervious, or impenetrable, surfaces. Rain within the catchment and recharge zones washes pollutants into karst features and directly into the aquifer (Mahler, 2004). Second, with increased population comes a higher demand for water. If the amount of extraction exceeds the amount of recharge, the water level within the aquifer will fall. If this occurs over a long period of time, the water table in the aquifer could be lowered substantially making existing wells unproductive, or allowing an influx of “bad” or saline water (Hovorka, 1998). The Edwards Aquifer is home to over 15 endangered species and serves as a main water supply for 2 million people (Sharp and Banner, 1997). It is essential for life in central Texas. Water conservation and contaminant transport regulation have become an essential part of protecting our aquifer. implications for aquifer management. Bureau of Economic Geology, Report of Investigations, 250. Mahler, B., 2004, What’s in the Water? The History and Future of Barton Springs. Hot Science – Cool Talks #31. Groundwater, unpublished Ph.D. Dissertation, University of Texas, Austin, TX, 432p. Area, Texas, 1991, with 1934-91 Summary, Edwards Underground Water District Bulletin 51, 169p. Edwards Underground Water District, San Antonio, TX, 38p. Larkin, T. J., and Bomar, G. W., 1983, Climatic Atlas of Texas, Texas Department of Water Resources, Austin, TX, 151p. The limestone rocks of the Edwards group were originally deposited about 100 million years ago when a warm, shallow sea covered central Texas. Marine life flourished. As the marine organisms died, their calcium carbonate shells and skeletons sank and solidified into layers of limestone. The sea level lowered and the Edwards limestone was buried and then uplifted. Major karstification began with a major uplift approximately 25 million years ago (Sharp, 1997). Fractures and faults, such as the Balcones fault, allow rainwater to penetrate into and dissolve the soluble rock layers of the Edwards group (Ferrill et al., 2004). The Caverns of Sonora are located 8 miles west of Sonora, Texas near Interstate Highway 10. Originally known as “Mayfield’s Cave” because it was located on Mayfield Ranch, local cowboys knew of this cave for many years. The cave was professionally explored in the 1950’s and developed using revolutionary techniques for showing and maintaining a cave in the most natural condition possible. Claimed by many to be one of the most beautiful caves in the world, visitors often compare sections of the Caverns of Sonora to being inside of a crystal-lined geode. Inner Space Cavern, 20 miles north of Austin, was originally found by the Texas Highway Department in 1963. In order to determine that the ground could support the weight of a highway overpass, they drilled several test holes; repeatedly the drill bit broke through into open cavities. The first human to enter the cave was lowered on a drill bit through an enlarged test hole. Inner Space Cavern is a highly decorated cave with over 4 miles of passage. The man-made entrance is the only access into the cave passages; however, the remains of 5 sinkholes called bone sinks, rich in fossil remains, have been identified. The cave tour only covers about 1/8th of the existing passage in Inner Space Cavern. Natural Bridge Caverns are located between San Antonio and New Braunfels, 8 miles west of 135. The main cavern was discovered by 4 cavers from St. Mary’s University in 1960. The area was known as a well-karstified region, so the cavers went scouting for caves. After a crawl through a long, tight crawl, Orion Knox stumbled into the large network of passages that the tour route follows today. The two caves received their name from the natural rock bridge above the entrance to the north cavern. The tour route passes through a series of large highly-decorated rooms and reaches a depth of 200 feet at Purgatory Creek. After heavy rains, recharge causes the water table to rise and occasionally fill Purgatory Creek. The term “cave” refers to a natural opening, usually in rocks, that is large enough for human entry (Gunn, 2004). There are several different types of caves: volcanic, glacier, crevice, erosion, and solution. Solution caves occur in limestone and gypsum and are the most common type in central Texas. Although dissolution is the dominant process, other processes such as erosion and gravitational breakdown, or collapse, can contribute to cave development (Palmer, 1991). Fig. 1: Rainwater mixes with carbon dioxide in the atmosphere and soils to form carbonic acid (H2CO3), which acts to dissolve away limestone. Minerals vary widely in their chemical response to groundwater. Calcite, for example, is soluble in a weak acid such as H2CO3 – carbonic acid. Thus, limestone which consists primarily of calcite (CaCO3) is vulnerable to chemical attack by groundwater. Carbonic acid can form by a reaction between water and carbon dioxide. As rainwater, already slightly acidic (pH~6), passes through the atmosphere and the soil layer, it mixes with carbon dioxide and forms carbonic acid (Fig. 1). The acidic water passes through fractures, crevices, and cavities and dissolves the limestone very slowly, enlarging the network of passageways. Most solutional caves require more than 100,000 years to grow large enough for a human to be able to pass through (Palmer 1991). Most caverns are created at or just below the water table in the zone of saturation in limestone. If the water table is stable, large openings can be created because water would contact all surfaces of the cave, dissolving the limestone at a large scale. If the water table drops, the area of active cave formation will move lower into the bedrock and the upper openings are left in the zone of aeration, only subject to dissolution from running water. Water dripping through these dry passages may deposit CaCO3 in various forms collectively referred to as speleothems. Caves allow humans to access and investigate subterranean processes up close. Geology and tectonic activity, or folds and faults within the earth’s crust, is immediately obvious in caves. Cave walls, ceiling, and floor can show bends, fractures, and folds in rock layers. Cave passages cut through the rock layers and make rock identification easier. Aquifer Recharge becomes an observable process in caves. 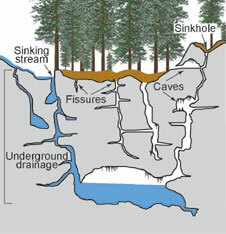 An aquifer is a body of rock capable of containing and transmitting large quantities of water (Gunn, 2004); caves are the largest pathway within the aquifer. The water supply within the aquifer is slowly replenished with each water droplet that falls from the cave ceiling to the floor below. Water flow paths are recorded by the location and patterns of formations throughout the cave passage (Musgrove et al., 2001). Curtains of stalactites, sinuous draperies, or a line of stalagmites can form as water passes through fractures. A tight cluster of soda straws can indicate diffuse flow – water passing through minute void spaces within permeable limestone. Musgrove M., Banner J.L., Mack L.E., Combs D.M., James E.W., Cheng H., Edwards R.L., 2001, Geochronology of late Pleistocene to Holocene speleothems from central Texas: Implications for regional paleoclimate: Geological Society of America Bulletin, v. 113(12), p. 1532-1543. As slightly acidic water passes through limestone, it dissolves away calcite, a portion of the calcium carbonate rock, and carries it in solution. When a super-saturated water droplet enters a cave a chemical reaction takes place. The CO2 dissolved in the water, which formed dissolved H2CO3, comes out of solution. The water becomes less acidic (lower pH), and the calcite (CaCO3) previously held in solution is deposited in formations called speleothems. There are several types of speleothems. Flowstone forms as water flows over walls, floors, or other formations and builds up sheets of calcite that look like a rock waterfall. Stalagmites rise upward from the floor of the cave passage and are usually formed by water dripping from ceiling. Stalactites hang from the cave ceiling and form as water flows down the formation deposits layers of calcite. You can remember the difference between stalagmites and stalactites by remembering that stalactites cling “tight” to the ceiling. When a stalactite and a stalagmite join they form a column. In general, all ceiling formations are stalactites, but because there are so many distinctive types, there are more specific terms. For instance, a drapery develops when water deposits calcite in thin sheets that hang in delicate folds like a curtain. The tiny, hollow stalactites known as soda straws are particularly fascinating. They grow as water runs down inside them and deposits a ring of calcite at the tip. Helectites, or delicate, twisted speleothems, form as air movement within particularly humid cave passages causes the calcite formations to project at odd angles from the ceiling or walls of caves. They have a curving or angular form that makes them look like they formed in zero gravity. Speleothems are not only beautiful, they’re useful, too. Examining the location of speleothems within a cave can help explain how the cave formed. A cluster of soda straws on the cave ceiling can indicate diffuse flow—where water passes through the rock. A long, sinuous drapery hints at fracture flow—when water flows through cracks in the rock. Even the color and composition of the speleothems can be informative. It suggests what types of rocks and minerals exist along the recharge flow path. As the speleothems grow, they record atmospheric information such as climatic conditions and ocean levels. Scientists at the University of Texas have found speleothems in central Texas caves that are more than 350,000 years old (Musgrove, 2000). Growth rates are hypothesized to correlate to rainfall: the more rainfall the faster the formations grow. By examining growth rates scientists are able to reconstruct regional climactic conditions (Musgrove et al., 2001). Banner, J. L., Guilfoyle, A., James, E., Stern, L. A. and Musgrove, M., 2007, Seasonal variations in modern speleothem calcite growth in Central Texas, U.S.A. Journal of Sedimentary Research 77, 615-622. Society of America Bulletin, v. 113(12), p. 1532-1543. If you are planning a field trip for a class or just your family check out the websites below to find out more information on tour times and prices. Download powerpoint presentation virtual tours of Inner Space Cavern and Natural Bridge Caverns here!